As a board certified ophthalmologist and retinal specialist, William L. Benedict, M.D. has been with the Eye Care Center of Northern Colorado since 1993 and serves as director of the Retinal Center of Northern Colorado. Dr. Benedict earned his medical degree from the University of Cincinnati, College of Medicine and a Bachelor of Science in chemical engineering from the University of Michigan. He completed an ophthalmology residency at the Cleveland Clinic Foundation, and went on to two years of vitreoretinal fellowship training at Texas Tech University. Dr. Benedict is currently an Assistant Clinical Professor of Ophthalmology on the University of Colorado Medical School faculty. Dr. Benedict specializes in the surgical and medical treatment of vitreoretinal disorders, such as diabetic retinopathy, macular degeneration, retinal vascular diseases, retinal detachment, uveitis and severe ocular trauma. 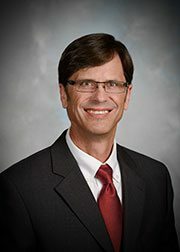 With extensive training and experience in the use of ocular lasers and current vitreoretinal techniques, Dr. Benedict stays on top of the latest advancements to ensure every individual obtains the best retinal treatment available.